Yes, yes! And despite being pressed on all sides by people—something that makes me acutely uncomfortable—I was thrilled to be with the thousands who had come to stand up for women’s rights, children’s rights, men’s rights, and human rights. 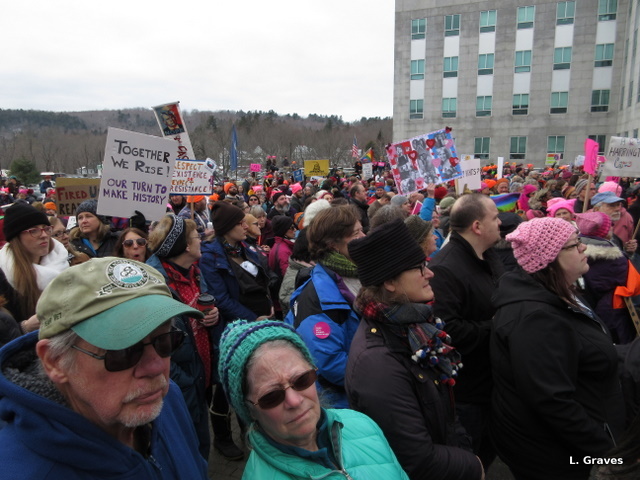 Even though the past two months have been grim for progressives, the mood at the Augusta, Maine, march was anything but gloomy. 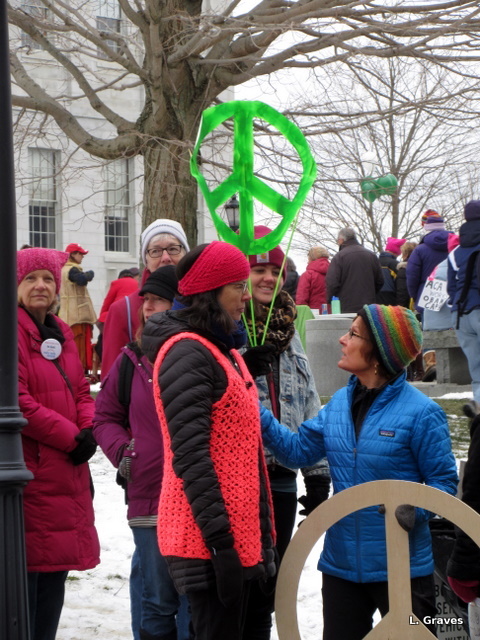 Instead, there was an almost festive air at the gathering at the State Capital. Judy observed that there were lots of happy faces, and Clif noted that the event had a Common Ground Country Fair feeling. Seeing so many good, beautiful, plain people out on a raw, gray January day brought tears to my eyes. There is hope for this country, despite the horrendous feelings and words that were unleashed by this election, where a terrible line has been crossed. These marches, not only in our country but also around the world, were a mighty rebuke to an administration for whom “alternative facts”—otherwise known as lies—are second nature. 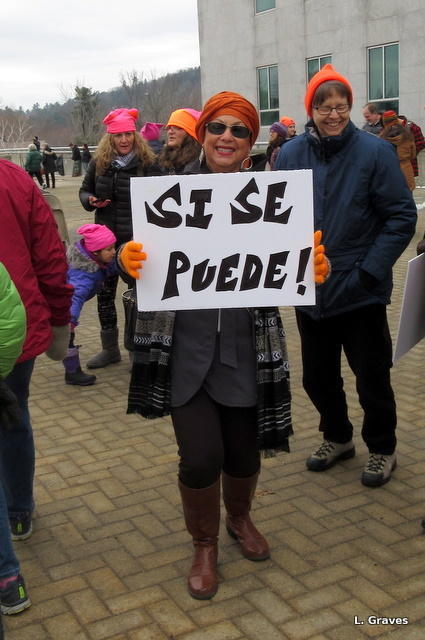 As one sign at the Augusta march proclaimed: When injustice becomes law, resistance becomes duty. 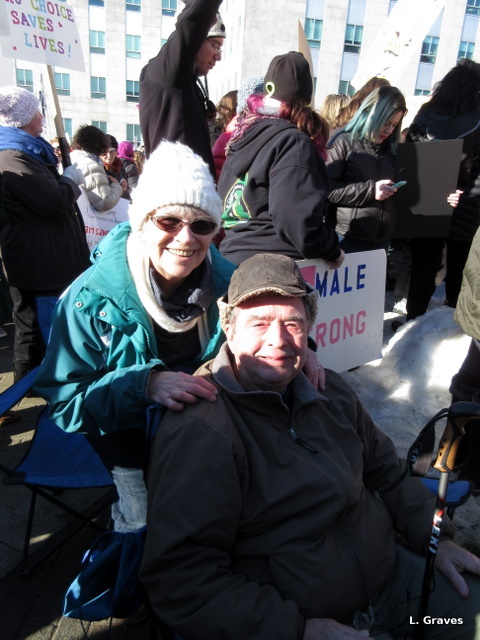 All ages came to the Augusta march, from babies snug against their mother’s chests or backs to teenagers to young adults to older adults to seniors. 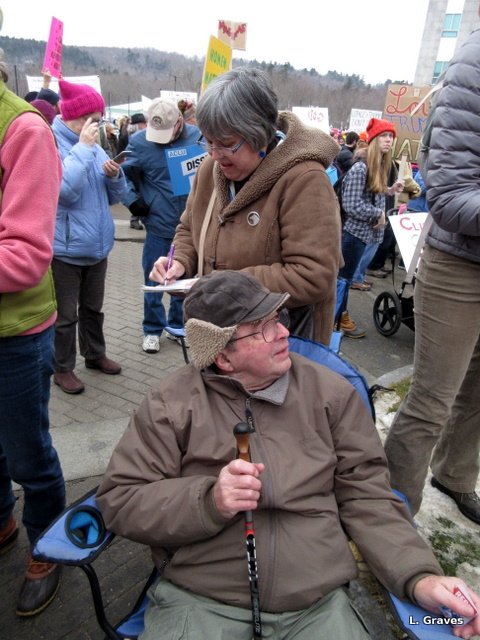 The crowd was so vast that I could barely hear the speeches—a little disappointing—but the main thing, as I was reminded by my friend Paul Johnson, was to be there. 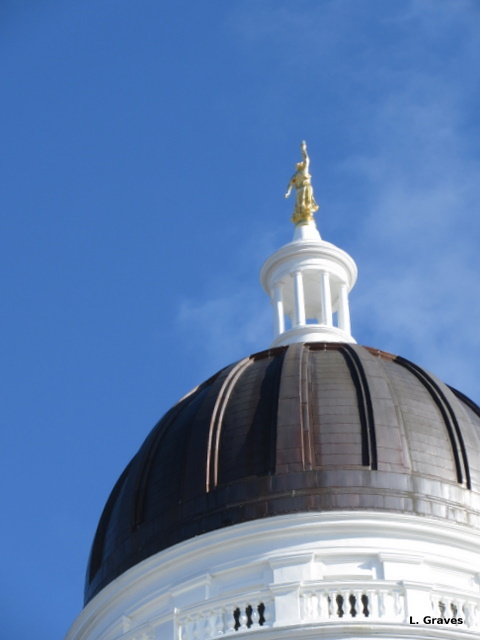 Toward the end of the rally, the sun came out, and on the domed roof of the Capitol, Minerva stood bright and gold against a cerulean sky. May her wisdom shine on us all. Me, taking notes and Paul Johnson, sitting. In honor of Carrie Fisher. Minerva, gleaming over us all. Denny and I were there, too …. And our children, grandchildren and sisters were all marching in their respectives cities. Truly an awesome world-wide display of solidarity! It makes me feel better than I have felt since November. Oh, I hope so! What a comfort to know how many sister marches there were, and that you were in one of them! I, like you, hate large crowds; however, I appreciated the warmth of the closely packed group – both figuratively and literally. We were near the podium so could hear the speakers clearly. I am sorry you did not have that opportunity. They were wonderful. 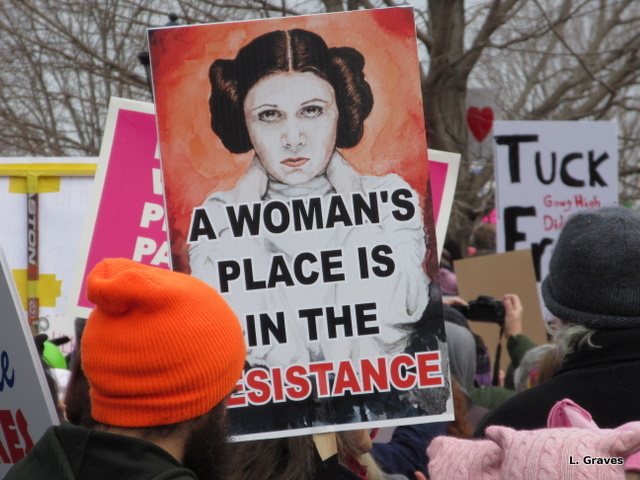 I appreciate the pictures I have seen of sister marches all over the world. It struck me in a way I had never experienced before how much influence the US has world wide. Oh, yes! Those sister marches were incredible. While I felt a little too closed in, I was so glad to be at the rally in Augusta. It was such a wonderful experience, Laurie! Thanks to both you and Clif for being there with us and documenting it for us here. And many thanks to the two of you! You both made my day. Looks like your weather was a lot colder than ours. It’s so inspiring that there were all these rallies all over the country, in cities big and small, and involving people who had never done anything like this before. Jason, much colder and much more than in your neck of the woods. Yes, very inspiring. Now comes the hard work! Many thanks! What a discouraging time to live here. When injustice becomes law, resistance becomes duty – good words to live by. Good luck! Oh many thanks! I can only imagine what a hot mess we look like from away. We sure look like one close up, but there is resistance, and lots of it! Yes, with our referendum we are in a similar mess – all lies and idiots. Pah! Sigh. It’s happening in many places. I know what you mean about not liking crowds. The D.C. march had a festive ambiance too. I expected mostly middle aged (aka myself) college graduates transported from our radical days. Yes, we were there, but so too were children, teens, young adults, and folks of all ethnic backgrounds. There was even a dozen Jesus Doesn’t Want You to Go To Hell protesting-the-protest gusy (yeah, white males) trying to antagonize the marchers. We passed them by and let them be. To me the point is not taking power, but spreading it. Unfortunately, that alternative-facts crowd sees life as a zero-sum game which they want to win. I’ll be blogging on that topic soon enough. Yes, yes, Oscar. And I decided that even though being among so many people was grueling, the point was not to be comfortable. The point was to be present and counted as part of the protest. I also hate crowds but wanted to go to this one. I was out of state, however, for a party for my niece, who is expecting twins. Thanks for giving us a first-hand report. Now we need to get on the phone to Susan Collins in hopes of persuading her to stand up and resist with us. Wow, twins! It was actually pretty grueling for me to be in that huge crowd. Nevertheless, I’m glad I went. To be part of such an event was the discomfort. I’m so glad to hear that you went, Laurie — especially being claustrophobic. You did it. Congrats to you and everyone who marched in Augusta. Thanks, Cynthia! So worthwhile to go, despite being claustrophobic. Many thanks! For progressives, it’s been a very hard time in this country. You all have a great deal of support in U.K. So heartening to know! And I hope you all know that there are many, many people in the U.S. who are terribly upset with the way things have gone here. A sigh of relief across the pond!